We hear of online predators all the time. You hear about things you can do to protect your children. Have you done them? We have two children that use the internet every day. Below are some of the rules we use that can help you make sure the internet is a safe place for your own children. Make sure an adult approves adding an email address. Don’t allow your kids to send emails to people they don’t know, or subscribe to emails on websites. This can send junk mail to your children’s email box. Junk mail can contain information you do not want your children reading, as well as links to websites. Keep the computer in a visible place in your house. If your children are surfing in private, you don’t know what they are viewing. It’s so easy to find bad stuff on the internet. Make sure you can see what your kids are visiting. Go in after your child has gone to bed and check the internet history to see what websites they have visited. If you feel like they have been sending inappropriate emails, you can check their email also. You can see what they have sent and what they have deleted. Provide a list of favorites for the websites they are allowed to visit. 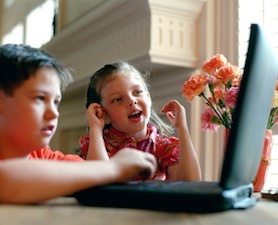 If they have heard about a new website, check it out first to make sure it is kid friendly. Don’t allow them to search through Google or another search engine. Making sure they stick to the approved list increases the odds that their internet viewing will be safe. Following a few suggestions can help ensure that your children are safe when online. Our children live in a different world from the one we grew up in. Make sure they are safe.